Opel/Vauxhall was the only major European volume maker to post a sales gain in November, thanks to cars such as the new Meriva, shown. PARIS (Bloomberg) -- Fiat S.p.A., Toyota Motor Corp. and Ford Motor Co. led an eighth-consecutive monthly decline in European car deliveries as fallout from last year's government incentives hampered a recovery in the region's largest markets. Registrations fell 6.5 percent to 1.11 million cars in November from 1.18 million a year earlier, Brussels-based industry association ACEA said today in a statement. Eleven-month sales dropped 5.1 percent to 12.7 million cars. Fiat group sales, including the Fiat, Lancia and Alfa Romeo brands, fell nearly 24 percent to 74,195. Toyota recorded November's second-biggest sales decline, with a 20 percent drop to 44,670 registrations. Ford was third with a 15 percent slide to 85,856 cars. Volkswagen AG, including the VW, Audi, Skoda and Seat brands, had a 5.2 percent decline to 235,614 vehicles. A 12.2 percent rise in Skoda sales and 2.4 percent volume growth at Audi helped offset a 13.6 percent drop in VW brand sales in November. "Sales of the VW brand were once more disappointing ... largely because the current generation of the best-selling Golf is entering its third year on sale, and the Golf and Polo appeared to generate a lot of orders though scrappage, especially in Germany," market analysts IHS Automotive said in a research note. Renault group sales dropped 12.1 percent with a 16 percent decline for the Renault brand offset by a 6.6 percent increase at the automaker's low-cost Dacia brand. Renault sales dropped because the company chased volume and market share during the early part of the year with aggressive incentives and discounting and is now reining in this strategy, IHS Automotive said. French rival PSA/Peugeot-Citroen registered a 9.5 volume drop with Citroen sales falling 15 percent compared with a 4.5 percent fall for Peugeot. The recovery in eastern European markets helped Hyundai Motor Co. to post gains in November. Hyundai brand recorded a 6.4 percent increase to 30,087 sales, lifting its market share so far this year by 0.2 percentage point to 2.6 percent. GM's registrations for Opel/Vauxhall and Chevrolet advanced 4.2 percent to 98,319 with Opel's volume up 6.5 percent and Chevrolet sales rising 3.6 percent. 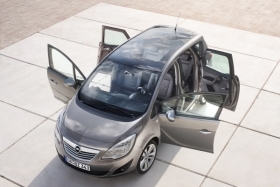 An Opel spokesman said the new Meriva minivan as well as strong sales for the Astra compact and Insignia mid-sized car helped boost the brand's November sales. Opel's growth took place across Europe, the spokesman told Automotive News Europe in a e-mailed response to questions, adding that the current customer order intake trend indicates a solid base for further market share gains in the coming months "so we are confident to be able to record another strong month in December." European sales at BMW jumped 19 percent last month to 66,050 cars as the company won buyers with the X1 compact SUV and new-generation 5-series sedan. Daimler AG's Mercedes-Benz brand led the Stuttgart-based group's 2.5 percent gain to 60,002 vehicles. Market disparities lingering behind the stimulus programs widened as a recovery gathered pace in smaller European countries without their own mass-market manufacturers to support, which offered little or no incentive spending. Italian registrations slumped 21 percent, the biggest decline after Greece and Spain, contributing to Fiat's 24 percent plunge in regional sales to 74,194 cars. The year-on- year comparison was worsened by a surge at the end of 2009 in Italy, where customers rushed to qualify for government incentives before the payments expired. The French market shrank by 11 percent in November. A trade-in bonus of 1,000 euros ($1,330) was cut by 250 euros in both January and July. The contraction helped drag down European registrations last month by 12 percent to 115,487 cars at Renault SA and by 9.5 percent to 144,542 at PSA/Peugeot-Citroen SA. “French sales have been getting a stimulus all the way, so we still don't know where the real market is,” said Philippe Houchois, a London-based analyst at UBS. Markets that had few or no subsidies, or where scrapping incentives halted more than a year ago, are showing improvement. The decline in the German market, where the subsidy stopped in September 2009, slowed to 6.2 percent from 20 percent in October.